For Amit Bhatia, his students' success stories matter more than the John P. McNulty Prize that his project recently received from the Aspen Institute. That project is Aspire India, a social enterprise that Bhatia founded in 2007 to help people develop skills and get better jobs. Aspire India, based in Gurgaon, near Delhi, is changing lives in 16 states. "If it were not for my training, I would be a small-time shopkeeper in Jammu," says 29-year-old Rahul Parihar, who has been working with IBM for five years and now lives in Gurgaon. He started out as a customer care executive at IBM, and now makes Rs 3 lakh a year as a senior executive. "I am able to talk to you in English because of my training at Aspire," says 24-year-old Chandan Kumar Singh, who grew up in a village in Bihar and studied up to class 12. He was part of Aspire's first batch of students in November 2007. After the Aspire course, he got a job with a BPO in Noida, near Delhi. His talents prompted senior colleagues to suggest he join the travel industry. Now, as a travel counsellor at Carlson Wagonlit Travel, he earns Rs 3.4 lakh a year. He says: "My dream is to work as a trainer for Aspire. It has transformed my life." 52,000 no. of students Aspire India has helped to get better jobs. It aims to train one million students by 2022. Parihar and Singh are lucky. India's rotefocused education system turns out students with skills that have little relevance to the jobs market. Just about one in ten of India's two million graduates are employable - industry jargon for people who can be made job-ready with a few weeks of training - in the call centre industry, estimates industry lobby Nasscom. The National Skill Development Policy puts the number of people who need to be "skilled" by 2022 at 530 million. Institutes such as Aspire, Global Talent Track, IIJT and Centum seek to meet this need. Bhatia always had a teacher in him. "I always wanted to be a social entrepreneur in education," he says. "In my first job in 1991, I was a lecturer at Shri Ram College of Commerce, but Delhi University politics suffocated me, and I left in two months." He loved teaching, though, and five years later he was back at the university, making less than what he earned in the corporate job he quit. "But I lasted there only two months," he says. He returned to the corporate world for the next 11 years, and worked with consulting firm McKinsey, B2B e-commerce outfit FreeMarkets and outsourcing company WNS. He returned to education in 2007 and founded Aspire. Aspire developed its 'embedded education' model iteratively. Bhatia says: "We call this Aspire 3.0. We metamorphosed twice." He explains that the Aspire 1.0 business model served companies such as WNS, Wipro, and Accenture, who paid for train-to-hire services. Aspire sought out unemployed recent graduates in rural and semi-rural areas. "We tested them for potential, and trained them for jobs in sales, customer service, finance and accounting," says Bhatia. The economic downturn of 2008/09 resulted in layoffs. Aspire had to shut down its four academies in Belgaum, Gurgaon, Kolkata and Mumbai. But in late 2008 came Aspire 2.0 with a model where colleges paid for employability training. 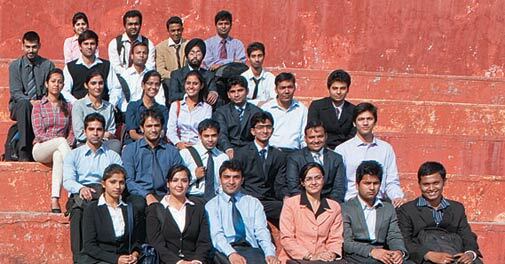 "We turned our business-tobusiness model into a business-to-education one," says Bhatia. When the job market improved in 2010, colleges dispensed with the training. "Finally, in Aspire 3.0, we invented 'embedded education', where we convince colleges to make our training part of the core curriculum." Aspire has built products to develop both soft and hard skills, which are implemented over two or more semesters. The focus is on the basics. "They taught me all the soft skills, the ability to understand my manager's expectations, the art of having a confident approach and, of course, speaking in English," says Parihar of IBM. Aspire has served more than 80 institutes and trained over 52,000 students in 36 cities. "Our goal is to train a million students by 2022, when India turns 75, from the national target of 500 million," says Bhatia. "We are also working on a curriculum redesign project with the Confederation of Indian Industry." Together with CII, Aspire is developing new curricula for engineering and management institutes. These will be submitted as CII's recommendations to the human resources ministry. When they are finalised, Aspire plans to build a digital product to help educational institutions to develop students' skills and make them more employable. "Certainly Aspire is making an impact," says Rajeev Arora, head of human resources at Mercer India. "We have hired students trained by them and have been happy with the results."